Imagine celebrating Pride in paradise: the warm ocean breeze rustles through palm trees as a cheerful attendant asks if you’d like another piña colada. Meanwhile, a poolside DJ keeps the party going with the latest beats. It’s the Caribbean sun with Vegas and South Beach vibes. Come September, the Dominican Republic and CHIC Punta Cana host the second annual Caribbean Pride. Pour yourself a drink from the wall dispenser in your room and get ready to celebrate Pride like only the Caribbean can. Scheduling transportation to and from the airport with Royaltan-owned Nexus Tours means you can relax from the moment you land in Punta Cana and not worry about a thing. Upon arrival, you’ll be greeted with a drink and a smiling face. With about 300 rooms and roughly 60 workers at the resort, you’ll notice seeing some of the same smiling staff throughout your stay, giving the resort an intimate and welcoming feel. Pro-tip: book a Diamond Club room with a swim-up pool just outside your balcony for a premium stay. Featuring an oasis of a main pool where most of the festivities will be hosted (including foam parties), guests have the gorgeous view of the ocean to one side or a mosaic-glass walled mermaid pool on the other. If you take a peek at the right moment, you might find a mermaid passing by. And please, for the love of vacations, don’t miss an opportunity to visit the Royal Spa (note: all-inclusive does not cover spa services). There’s nothing quite as relaxing as a thermal energy massage with some amazing hands and hot stones to work out all the knots. The desk attendant at Royal Spa suggested guests show up an hour before any treatment to enjoy the hydro therapy room, and trust me, it’s worth it. I’ve never been so relaxed. After your massage, take a step into the steam room, go back to your room to hop in the oversized whirlpool tub and take a nap before dinner—it’s the perfect day! The options for food and nightlife give guests variety and makes sure everyone in your party finds something to satiate their appetite. The Texas-like steakhouse simply named Hunter is a crowd-pleaser. If red meat isn’t your thing, I highly suggest the citrus marinade chicken breast (it comes topped with parmesan and bacon to give your taste buds a treat). For those seeking a more Italian affair, Vespa has all the pasta you could dream of, including a lasagna al forno baked in a wood oven that will make your mouth scream for more. Tagine, a Middle Eastern a la carte dining experience is a must, and there’s seemingly countless other culinary adventures to delight even the most discriminating palettes. CHIC pulls out all the stops from breakfast (here’s looking at you, Insomnia coffee bar) and poolside grills, straight through late-night munchies. From sun up to sun down, Caribbean Pride offers resort goers their choice of how to spend a day in the sun: various pool parties, exciting excursions, festive activities, international DJs, and renowned drag queens. And when the resort is adults-only and all-inclusive, the fun never stops. Put simply: sip, swim, relax, repeat. For something out of the ordinary, try their invigorating oxygen bar, Detox. Aptly named, guests breathe in pure oxygen, helping you bounce back from physical exertion, provide relief from stress, increase your concentration, and ease headaches (and hangovers—wink, wink). With activities to fill your schedule like yoga on the beach, mixology and cooking classes, and a newly redesigned casino, there’s never a dull moment. Take an adventure away from the resort with a curated list of exclusive excursions solely for Caribbean Pride guests. From snorkeling and exploring natural rock pools teeming with marine life that you have to see to believe, to sliding down a 700-meter zip line, there’s no shortage of experiences for guests looking for a little more action. If adults-only and all-inclusive weren’t enough reason to book your trip (you heard me—no kids and free alcohol! ), know that you’ll be surrounded by a couple hundred other GLBT folk having the time of their lives. 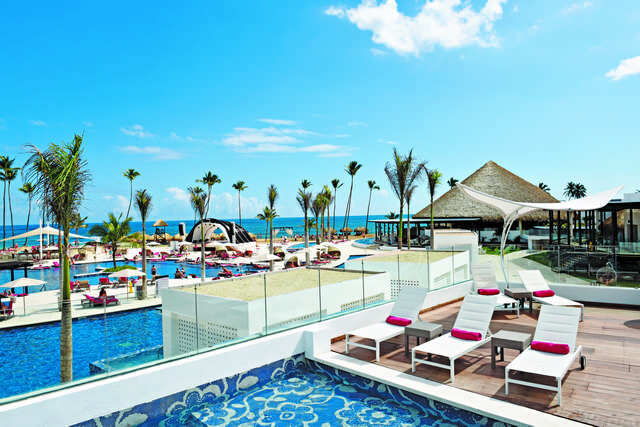 Different body types, races, sexualities—the entire atmosphere at CHIC Punta Cana is open and accommodating to all. Photos and words could never do CHIC justice. You have to be there to truly experience it: one stunning resort, seven days, over 50 Pride events, and fabulous people ready to party. For more information, visit www.caribbeanpride.com.